Anne Waldman’s chapbook is primarily composed of the single, long, title poem. The book is a fragmented meditation that approaches questions of war, conscience, feminism, art, history, and other subjects. It is a book that at once confuses and invites the reader to create meaning. The experience of living with this book for a while was like what I imagine Zen students experience in their search for no-meaning. First, an epigraph from the New York Times dated Nov 18, 2001. A site recovery worker writes about ghosts and what he sees, unseen by others. 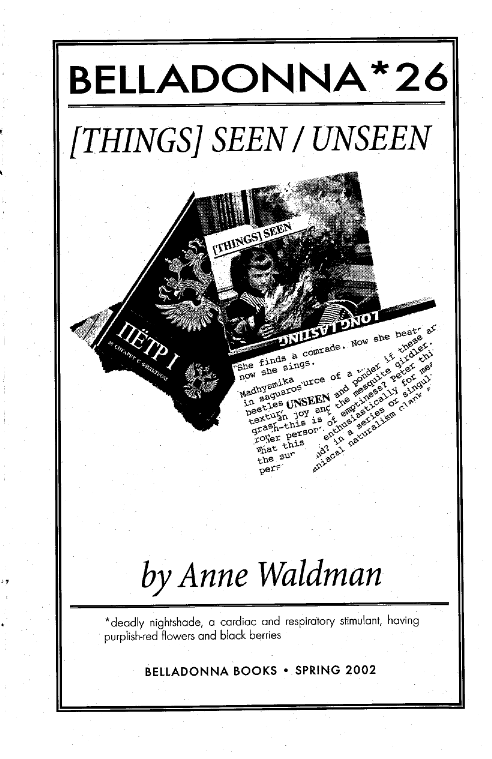 Waldman’s book is now placed in that context: under the specter of 9/11/01. The effect is that now, the book is grounded in that memory of 9/11, but it becomes also about the unseen, and somehow this makes the poem bigger than any fragmentary visions of that day and its aftermath. Next, the title poem: [Things Seen] Unseen, which is typographically separated by a line. The poem is a Ginsbergian free-verse piece that at times bewilders and then comes clear, momentarily. The ephemerality of the poem’s sense of itself suggests a consideration of the nature of reality. There are, undeniably, things unseen. What then is the relationship between the seen and unseen? What questions arise from that relationship and what answers, if any can be found there? Ofra Haza singing Galbi refers to a 1984 song that set a 17th century Arabic poem to music. La Pitture Etrusche di Tarquinia – Etruscan murals from 8th – 2nd Century B.C. A Bar At The Folies-Bergere is a painting by Edouard Manet of a girl behind a cafe bar staring directly at the viewer. From these notes, I glean a setting: the Arab world, its history…then, I am in Paris, and the beautiful girl behind the cafe counter looks at me accusingly, enticingly. I do not know what this all means. The effect is like notes of music that create an emotional tone beyond literal translation. This polar relationship, at once contradictory and complementary, invokes the idea of the other. The effect on each page is akin to that of the octave – sestet relationship in the Italian sonnet: the call and response that creates a dialogue of thought and meditation. This charged energy drives the reader on through Walman’s poem. Each fragmented idea leaps to the next with the reader in search of continuity. As the page is broken by the line, so to is the thought process, and so it must begin again. These metaphysical fragments prompt us to consider the cost and the remains of the “seen.” We search for answers in between, in areas of overlap between seen and unseen experience. Personally, I found it difficult to unravel [THINGS] SEEN / UNSEEN. Perhaps that is the experience Waldman wants us to have. The questions that arose in reading her work led to meditations, uncomfortable thoughts, feelings of anger and despair, even self-accusation. The work Waldman gives us is like a koan. We are invited to unravel the poem, trace its meanings, draw our own lines and raise our own questions. Peter Vanderberg served in the US Navy from 1999 – 2003 and received a MFA from Queens College, CUNY. His work has appeared in CURA, LUMINA, The Manhattanville Review and in collaboration with his brother James’ paintings in their book, Weather-Eye. He teaches at St. John’s Preparatory School and Hofstra University.